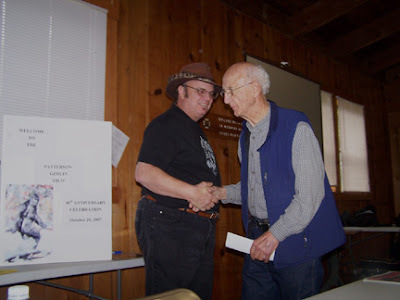 BIGFOOT'S bLOG: AN INFORMAL INTERVIEW WITH JIM MCCLARIN, Early PGF Investigator and Bigfooting Icon; FRANCES HODGSON, R.I.P. AN INFORMAL INTERVIEW WITH JIM MCCLARIN, Early PGF Investigator and Bigfooting Icon; FRANCES HODGSON, R.I.P. Jim McClarin and Patty Bigfoot together for comparison. 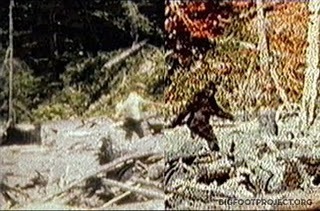 Image generated by Bigfootproject.org from Green and Patterson's films. 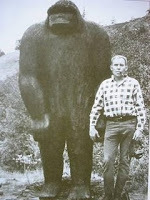 AN INFORMAL INTERVIEW WITH JIM MCCLARIN, Early Bigfooter and Witness to the Patterson-Gimlin Film Site. 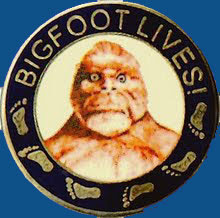 In the process of investigating the Patterson-Gimlin Film (PGF) and Bluff Creek history during our recent BLUFF CREEK FILM PROJECT (see future blog entries), we asked questions of many of the researchers in Bigfooting who had been there back in the early days. Some of these are our neighbors, like Al Hodgson and Jay Rowland. Others have been John Green, Peter Byrne, Daniel Perez, Larry Lund, Bill Miller, etc.. We also talked with current researchers such as Sean Fries, Cliff Barackman, James "Bobo" Fay, Tom Yamarone and many more. Some of these conversations will be presented in future blogs. Another whom we found contact with, via Facebook of all places, was Jim McClarin. We never expected to be able to get any word from him, as we'd heard he had permanently retired and distanced himself from Bigfooting since the 1970s. Luckily, this wasn't true, altogether; though the end-result interview is a little fragmentary due to his distance from the subject and those days long ago. We'll present the whole thing here as it is, hoping that any stray fragment of information just may come in handy for someone, as much of this did for us in our project. Many of our questions are strictly for Bigfoot nerds; but we're hoping you are as much of one as we are! Center, carved by Jim McClarin in the late 60s. Photo by Steven Streufert, 2008.
Who is Jim McClarin, you ask? Jim was a student here locally at Humboldt State University, back then in the mid-late 1960s. During that time he developed an interest in Bigfoot as he heard the stories from around here. He was among the few first viewers of the PGF in Yakima, WA, on October 22nd, 1967, having traveled up there with Rene Dahinden from Willow Creek. Soon after he was back down here and became one of the first, after such as Bob Titmus and Lyle Laverty, to visit the PGF site itself. He returned in summer, 1968, and was filmed by John Green in replication of the creature's walk. Jim published a newsletter for a while, now exceedingly rare, called MANIMALS, from 1972-1973 (see Daniel Perez' offering of them through the link above, with images HERE). 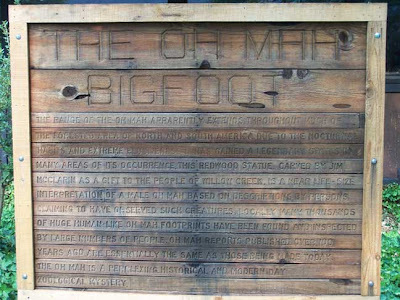 He has since retired from Bigfooting, but was gracious enough to try to recall things from the foggy ruins of time and pick his memory for us in the discussion that follows. Some questions were somewhat inconclusively answered, but others brought forth details we had never heard before. Some of these details were greatly helpful to us as we tried to trace the remnants of the old dirt road that followed the creekside of Bluff Creek, and in earlier days allowed access not only for logging, but also for Roger and Bob when they were in Bluff Creek investigating before the captured "Patty" on film. Some questions, the reader will notice, were not answered. 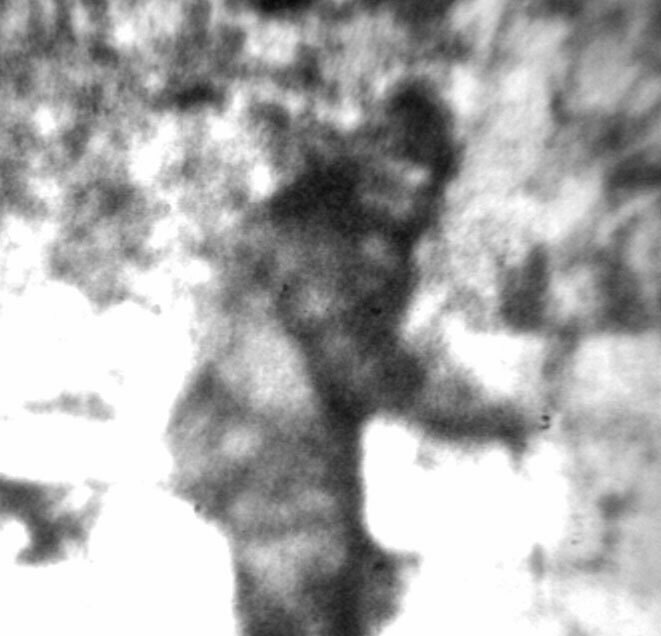 Jim had typed up a lengthy answer, but then dozed off at his laptop, and woke to find that movement while sleeping had deleted his reply--like so much in the history of Bigfooting, this information is apparently lost (like the second reel shot by Patterson on October 20th, 1967), at least for now. 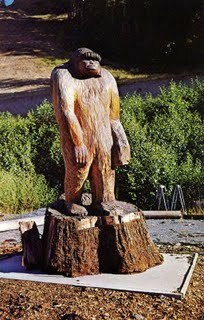 So far as we know he was last in the Willow Creek area in 2003, while attending as an honored guest as part of the "Pioneer Panel" at the Willow Creek International Bigfoot Symposium. actual, known film site, 1968. 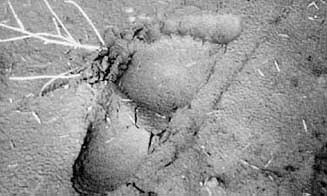 "Jim McClarin began his bigfoot investigations in 1963 and served as a member of early expeditions from northern California to Alaska. McClarin is famous for carving the first bigfoot statue (located at the corner of Hwy's 96 & 299 at Willow Creek). He corresponded with Ivan T. Sanderson, Roger Patterson, John Green, and Rene Dahinden. 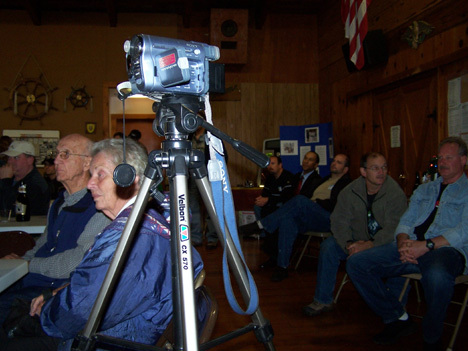 He recounted some of his memories in 2003 as part of a panel discussion during the International Bigfoot Symposium held in Willow Creek, CA. For McClarin, the "fluidity of movement of the muscles, as well as the light reflecting off the hair" convinced him of the authenticity of the P/G footage. 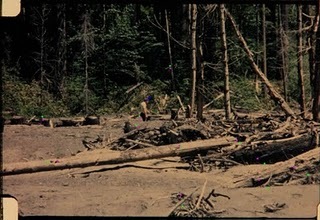 He and two others went to Bluff Creek to view the film site shortly after the film was shot and he was able to see tracks (in poor condition). A comparison movie of McClarin was shot walking along the trackway of "Patty." center, with reddish hair, next to Jeff Meldrum and John Bindernagel. Tom Steenburg, Al Hodgson and Dimitri Bayanov. Hello Jim, John Green recommended I contact you. I run a used book shop in Willow Creek, and have been studying the history of Bluff Creek and Bigfoot. I'm wondering if you could help us out with any indications as the the exact and proper location of the PGF site. Here's the questions I asked John Green and Peter Byrne. Perhaps you could fill in some of the blanks? I've been asking Todd Neiss about this, too, as he was there in the earlier 2000s with Byrne. I'm not sure when you were last on the site. 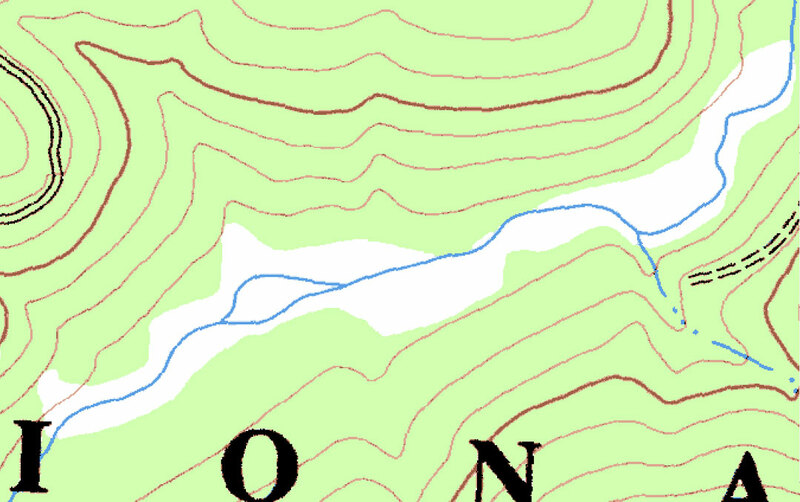 I have topo maps I could send if you'd like. A few associates and I (BFRO guys, mostly) are going back yet again this coming weekend to Bluff Creek, our goal being to record and document a trip from Louse Camp to where we all think the PG film was filmed. * when you were last there did you feel certain that you were on the right spot? * if so, what signs did you see that would confirm it? * was it upstream from the flat at the bat boxes? Or downstream, as MK Davis thinks it is? * how far up? At the big gulch with the logjam and rootballs, or perhaps a bit farther? If down, how far? * did you find the "big tree"? * how far from the current creek position is it, and how much is left of it in a level state as seen in the old days? 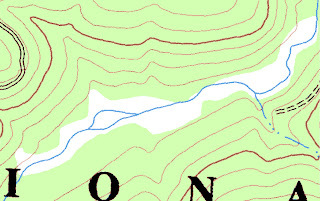 * If I send you a close-up topo map could you put your X on it? I've already asked this question of Perez, Barackman, and a traveling companion of MK, as well as many of the California BFRO guys. Al Hodgson feels that the site visited in 2003 is incorrect. I feel that your perspective on these matters would be invaluable, especially as a new generation is moving in, and there are some wildly divergent opinions. Your reply before Friday would be greatly appreciated! Thanks! Hello Jim, We're just back from the film site area. We are pretty darn sure that we have found the big trees in the back, and the site. However, it is really difficult to compare it in its overgrown state today to the way it was after the 1964 flood, as seen in the PGF from 1967. I found Peter Byrne's location of the site to be utterly wrong. John Green couldn't really recall how to get to the site, and couldn't see the big tree from where they went in 2003. However, going by Rene Dahinden's mark on the map as seen in BIGFOOT AT BLUFF CREEK, we know (if that is reliable) the real location of the site. That spot is where we found the nice big trees in the back. However, there is still much disagreement on where the site is located. There is, to my observation being there many times, no way to make an exact match with the old photos. Too much has changed. If you click "previous" or "next" on that screen you should see the next map, too. If you recall, it would be helpful to have your opinion as to the location. I am trying to contact all who were there at the earlier dates to see what they can say. Thanks! I hope all is well with you. A close-up view of the PGF Site on Bluff Creek. Can YOU place it? Where? Veni, vidi, sed non vici. I can't even tell you which flat it was in although I suspect the long one. I don't think I ever bothered to try to pinpoint it on a map before. If I had, I could probably do so again. And no, I haven't read your blog. I rarely visit BF sites, maybe one per year or so. I don't mind being available for questions about my experience but I have not tried to follow the subject. You did not conquer? Ah well. Mainly we are interested in any landmarks folks who were there might still recall, and the way they got to the film site. Did you walk up the creek, or access it from a road? Stuff like that. Also, just about ANY recollections of the time and your visits to the site or involvement with the film could help to fill in some gap in the history... and there are a LOT of such gaps. As I recall we were able to drive down to Roger and Bob's camp downstream from the site. When I went there in '67 after returning from BC and the showing of the film to the science gathering, we saw hay leavings where the horses had been kept as well as plenty of droppings and hoofprints along the way up to the film site. I think the film site may have been between 1/4 and 1/2 mile upstream from the camp. Coulda been further. I'm not certain but, since we went in a jeep, we may have 4-wheeled it in to the site. Tere was no mistaking the site since the prints were still quite visible, it matched the scenery from the film, and plaster bits remained from Bob Titmus casting a series of the tracks. That's puzzling. There is a camp site right down from the film site, about a quarter of a mile, but Roger and Bob are supposed to have camped 2 or 2.5 miles downstream, according to various accounts. Barbara Wasson said the camp was a little ways north of the bridge over Bluff Creek, down near Louse Camp. Just yesterday we went there and found the only spot around where someone could camp, so we thought perhaps we'd found it. The problem is, all the books say so many different things. We're pretty sure of the site of the film, but it seems the controversy will never go away. Wasn't there a dirt "road" all the way up the creek? It seems to me much of it would have to have gone right through the creek, or ford across it constantly as it winds back and forth against it's banks. I'm sitting right next to your statue as I eat at the Mexican restaurant. Someone 1s taking pictures of it right now. OK, it's possible that they were not camped where I thought they had been camped. But where we saw hay leavings and piles of horse dung at the point where a dirt road led down to the creek bed was nowhere near 2 - 2.5 miles downstream of the film site. As I recall we drove right to the apparent camp site without any false leads so I must have had explicit directions from Roger or perhaps from Al Hodgson who Roger had talked to following their exit from Bluff Creek. I'm not sure if this was before or after their drive to the McKinleyville airport to ship the film back to Washington. I'm confused at this point as to whether they said they shipped the film to Roger's brother-in-law Al DeAtley or directly to wherever it was processed. BTW, I had been to Louse Camp, talking to some bear hunters there on my first visit to Bluff Creek in the summer of 1966. It was down much closer to the mouth of Bluff Creek as I recall and not in the actual creek bed. The "camp" I saw was down in the creek bed and would have been flooded if there were torrential rains, perhaps one reason Roger and Bob were in a hurry to leave. Their stated reason as I recall was that they were worried about the road surface becoming impassible. To avoid possible confusion, I meant I'm not sure whether they told Hodgson before or after their trip to the airport. Re a dirt road up the creek, yes there was a gravel road (natural creek bed gravel) that crossed the creek at or close to the apparent camp site, then extended all the way up to and past the film site along the eastern side of the creek. I recall a road angled up the east slope off this creek bed road but I don't recall whether it was drivable or just a cat trail. I think it met a roadway higher up on the east side that could be seen in spots from the creek bed but I didn't go up there. I think Roger and Bob said they rode their horses up there to try to intersect "Patty's" trail after she departed the creek bed uphill in that direction but were unable to spot anything. So, regarding the camp site: it was right near by the film site? There are other accounts of a horse camp in that spot, which by your description is right where the current road leads down from the ridge road above to an area with a fire ring and a parking area. From there one proceeds upstream just a short ways up the creek or through the woods to the sandbar where the film was shot. We are talking football field distances from there, not miles. In all his various accountings, Gimlin talks of them riding out from their camp and heading upstream about 2.5 miles to where they saw and filmed the creature. There are accounts in distinction to this, speaking of the horse camp, and even of a primitive corral structure, just down from the film site. Louse Camp is approximately 3 miles down, and is as you describe it, up from the creek bank. The possible Patterson-Gimlin campsite we found was just past the bridge over Bluff, at an area where there appeared to be an old creek ford, as described to us by Al Hodgson in a lengthy interview we did with him earlier this year (you should read it--links are on the upper right side of my blog). Al seems to think the film site is farther downstream from where most believe it is today. He was there, and got there by hiking up the creek. I am wondering, when you went there, where did you put in with the jeep to head upstream, and how far did you then drive? Also, this is the trip right soon after the film was shot, right? I mean, you went there again the following summer with John Green, and that later trip was when you were filmed walking in the trackway, right? I wonder, with whom did you go up there on that first trip? Re mailing the film: most now believe they took it to Murray Field, outside of Eureka. It was then received by DeAtley and apparently taken to a private processor they knew, as no official Kodak shops were open on Saturdays. Do you know more about any of this? These timeline issues are commonly raised by debunkers who assume it must mean that the story and therefore the film could not be true. Gimlin says they went directly to Willow Creek and saw Al, then down to the coast to send the film. However, Al still claims that they had gone over the Bald Hills Road to Eureka, mailed it at the main post office, and then come back to Willow Creek to tell Al. The problem is that Al's account could not have been accomplished in the given time, and the post offices would have been closed besides. Any perspectives on all of this? Also, when and how did you meet Rene Dahinden, before heading up to Yakima to view the film, and how did you guys get there? If I had taken the film, I don't think I would have sent it off on an airplane unless I was deep in a wilderness someplace. Even then, I'd probably have insisted on flying out with the film. Why it was deemed so important to get it to DeAtley I can't quite fathom. What would an extra day or two hurt? At any rate, all I know is that I remember they had reportedly sent it by plane. I didn't get the story from Roger but from someone else. I met Dahinden at Hodgson's variety store. I think he was there by the time I made it over there. 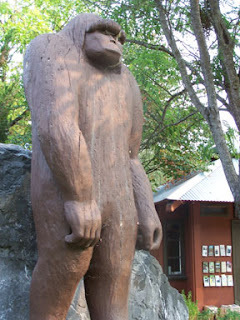 Hodgson had come over earlier that morning to the Bigfoot Motel where I had spent the night and informed me of Roger's story. I got dressed and headed over to the store. That may have been my first meeting with Dahinden although I was quite aware of his work in the field. We decided to get up to Yakima as fast as possible so we could see the film. We caught a plane from McKinleyville to Portland, then from Portland to Yakima where we were among the first seven people to view the film. Yes, you may use anything I have written here. The apparent camp with hay leavings, etc. that I saw was less than a mile downstream from the film site, possibly as little as 100 yards as you suggest. As I recall the road down to the creek at that spot crossed the stream at or very near that little camp and continued up along the right side (east side) of the stream to and past the film site. It was possibly only a week after the reported filming date that I first went to the site with two other guys in a jeep belonging to one of them. Daniel Perez has the name of the Jeep owner. I can't recall it just now. We forded the very shallow stream at an obvious fording place following the dirt/gravel road. It was not a far drive at all, a few hundred yards, maybe as little as 100 yards. Multi-frame PGF overlay, as caught in a screen capture from MonsterQuest. I had a super-8 movie with me and used it to film the footprints, then had one of the other guys film me as I walked along the trail of tracks. I had him film from where I thought Patterson must have been. I sent that film to John Green although he doesn't recall receiving or viewing it. I think he did see it, however, and determined it wasn't useful for size comparison since I was way off on the camera location. I think that's what gave him the idea to try for another film using slides from the PG film to determine where Patterson had to be holding his camera. I may never have gotten the film I made returned from Green, but if I did, it appears to have been lost, either by me or by Loren Coleman, to whom I gave most all my BF stuff when I got out of the business. Loren has checked without luck and figures if I ever gave it to him, it was lost in one of his many moves around the country. The Green film with me as subject was indeed shot the following summer. Sorry for the delayed reply. This has been a crazy week. Read the cover story article about me that came out at northcoastjournal.com to see part of what has been going on for me. base, the tree from which it was carved. The "road" up Bluff, then, was more of a winding 4WD trail, or old logging route, right? So, it sounds very clear from your description that you were in the same area we were, what is now called the "bat boxes" landing. 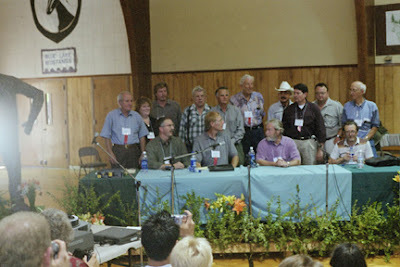 Were you there in 2003, after the Willow Creek Symposium? If so, what were your impressions of the site then, the changes to it, and the reactions of all of the people there? Could you even tell where the site was? When you were there in '67 and '68 did you see tracks beyond the main ten that Titmus cast? Where did they head in either direction? To disprove this so-called "Bluff Creek Massacre" theory, can you say if you saw any sign of bloody pools or prints, Bigfoot remains, signs of a tractor on site, or any other unusual thing like bullet shells? MK Davis says that Green, Gimlin and the others killed a family of BF and filmed it. Crazy, eh? When you first saw the film, did you view the entirety of both reels? What was on them, as much, and sequentially, as you can recall....? 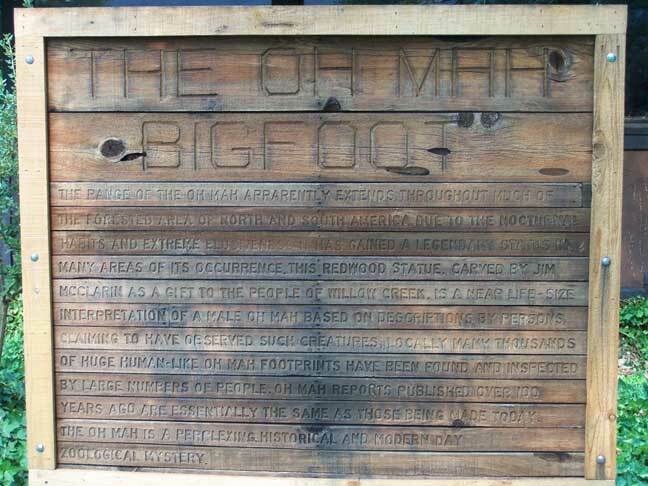 If we are doing a little interview here I should ask, how did you get involved in Bigfooting, and what were your first impressions and interactions with people like Green and Dahinden, pioneers in the field? "I would ask Jim, when he met Rene in Willow Creek, did it ever dawn on them or him that maybe they should visit the filmsite first, then go see the film? today. Photo courtesy of Bob Doran. The name of the guy who first took Jim to the filmsite was Richard Henry. Think that was around November 5th. As for the base camp, I don't think anyone now can say with any certainty. If that is what Barbara states, that may be so, as she had access to Bob Gimlin. I would just review with Jim some of the things he was feeling at the time. I think at one time he stated it would not be long before they would get one, but that was in 1967? Did he ever felt he was being watched while at the filmsite? What was his impression of George Haas? What was him impression of the 2003 Willow Creek gathering? 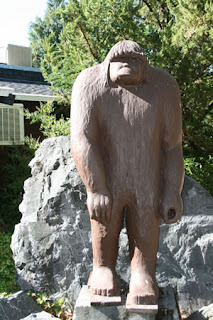 What was his impression of seeing his statute there in Willow Creek?" BIGFOOT BOOKS: Some good questions, and info on the Jeep fellow. Hi Jim... Did you get my last two messages? We are heading up to Bluff Creek again on Oct. 8th for yet more documentation. It would be great to have as much information from your experience as possible to take with us up there. So far your statements about the jeep trip up there have been VERY helpful. We are going to try to document the remnant signs of the old creekbed "road." Ha. I got your messages, got most of one answered, fell asleep at the computer (I have a laptop table I use in bed), and somehow erased it. At any rate it wasn't there when I woke up :-) I will respond in time. Jim, Just back from Bluff Creek! Your recollections proved to be very helpful. We traced the old Jeep road up the creek, finding remaining signs of it there even today. We also think we have located the P-G base camp site and the proper film site/trackway location. Well, we ruled out the MK Davis, Peter Byrne and Christopher Murphy film site locations, and clarified where it really is, I truly believe, all based on one "aerial" photo Rene D fortunately thought to take in 1972, that the case is now in the bag. I think Cliff Barackman's location is just slightly off. We climbed down the hill from above and I think very clearly found from that angle the properly rounded front of the sandbar, conforming perfectly to Dahinden's photo. Tall trees in back led us further. Moving back we found a cluster of big trees and an old stump buried by a big fern that match the film and known measurements pretty darn well exactly. The images will have to be manipulated in Photoshop to get the right comparative perspective (impossible now due to vegetation growth) to the old film site photos. The "big tree" seems still to be there. One large fir in that area seems to have fallen onto the sandbar. It has an alder growing out of its top, so now we need a tree ring sample to know its age. I feel no lingering doubt that we now know the exact location. Now all we need to do is measure the trackway in there for exactitude. A full report and YouTube videos will follow on my blog. Glad to hear it, Steve. I've been getting a little exposure to BF in reading Lloyd Pye's "Everything You Know is Wrong." Interesting insights but I don't follow some of his logic sequence. Pye's book stuck me as odd and fascinating, though I have not read it---it's hard to find a copy! We're still trying to put all the Bluff Creek puzzle pieces together, so any further recollections from you would be truly helpful and interesting. Don't feel obliged to answer all of those questions from Daniel Perez--I only sent those for your interest. Do you know how far past the film site the old jeep/logging road went? Did you see any tracks farther down from the film trackway? Things like that have still not been resolved. I don't know how far upstream the jeep road went and I saw no tracks beyond the stretch shown in the PG film. They disappeared once they left the sand and got onto the gravel. Be sure to get it at www.iuniverse.com. Best prices there, and new copies. Amazon will screw you over with used ones. Thanks for the tip on the Pye book... I will have to read that one soone. By the way, did you hear Sitchin just passed away a while back? I was wondering, did you ever get around to answering some of those questions I'd asked previously? I mean the ones you had answered, but then lost on your computer by accidental deletion? (See above on the Facebook page, probably in "earlier messages," if you don't have them stored away in your email.) I'm going to post the relevant stuff from our preceding conversation in a blog entry about the PGF site soon. I was hoping to reach a point of completion with that. Anything you can do, or have time and inclination for, would be greatly appreciated. Thanks! I don't recall the date of my trip with John to the film site but it seems likely John would have indicated that in his following book. The hour would have been late morning to early afternoon due to the fact we were in a canyon and would have been shaded otherwise. I don't know if John was trying to approximate the hour the PG film was taken in his film of me but the lighting dynamics meant we would not have been more than a few hours off. I haven't compared shadows in the two films and made no record of time or date that I recall. John wanted to use me as the model in his film for two reasons: I'm fairly tall, plus I had visited the site in the week or so following Patterson's filming and knew where the tracks had been. I visited after Bob Titmus had gone to the site and made his series of plaster casts of the best prints. By next summer there were still some nondescript, weathered depressions with small bits of plaster as I recall remaining from the track sequence. Obviously no flooding had occurred over the winter. I walked along these depressions and continued where I recalled the track heading. The impressions had stopped where the sand gave way to gravel/rock, meaning that the trackway was not very long. Lyle Laverty's PGF site track photo. In retrospect it would have been good to make detailed notes of how many footprints were visible (I'm thinking 12 to 18), take measurements of each stride and measurements to various surface features (logs, etc.) but it just never occurred to me at the time. What did occur to me was to film the tracks with a super-8 movie camera, then have one of the guys I was with film me walking along next to the footprints. Unfortunately that film was taken from nowhere near the same angle or with the same lens so it was useless for comparison. I seem to recall Green pronouncing it worthless so, while my memory of it is very indistinct, it seems I must have sent the film to him. I think that's what gave him the idea of doing another shoot with a camera like Roger used and using frames from Patterson's film to determine through triangulation just where his camera was during the original filming. Green does not recall my film at all and if I indeed sent it to him he might have returned it to me and I lost it. When I got out of the BF "business" I gave almost all my files, casts, and other research materials to Loren Coleman but he doesn't recall my original filmstrip either and says if he ever had it, it was probably lost in any one of a dozen moves since then. When I first viewed the site in '67 I estimated my own prints sank 1/4 inch while the adjacent BF prints sank an inch but the comparison was not especially valid since the sand was probably wetter on my visit, which no doubt affected the compaction. Be sure to read LOREN COLEMAN'S COMMENT for an update, by this link, or click below. Anniversary Celebration. Photo by Steven Streufert. 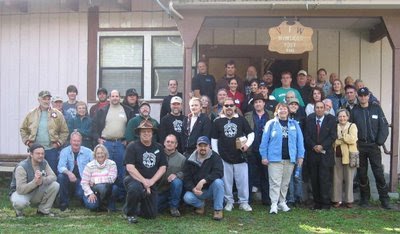 organizer Tom Yamarone in front, off center left; yours truly at far left. Really, too many luminaries to count--it was a GREAT time! "Passings: Frances Hodgson, the wife of Al Hodgson for 61 years, died on September 25, 2010. Her place in high profile Bigfoot lore is secure, as she was the person who took a call from the late Roger Patterson, when he phoned their home on October 20, 1967, to let them know a 16-mm film of Bigfoot was made in Bluff Creek earlier that day. Frances was involved in the church all her life and was a member of the Willow Creek Bible Church. She was born in Illinois on February 16, 1929." in Bigfooting. Photo by Steven Streufert, 2007. Serious hu-man toxic. Me want study salamanders! Too many hoax, way, way too much BS all humanogenic (me learn new word!). Bigfoot one day prove humanity is a hoax. Don't question Bigfoot. Question humanity. Me try be friend with you hu-man. Now me just do not know. Maybe me go back to being scary "cannibal," no more Mr. Nice Bigfoot. Yeah, me do that. 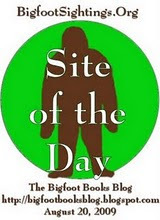 This blog is copyright and all that jazz, save for occasional small elements borrowed for "research" and information or satirical purposes only, 2010, Bigfoot Books and Steven Streufert. Borrowings will be tolerated for non-commercial research purposes without the revenge of Angry Bigfoot, if notification, credit, citation and a kindly web-link are given, preferably after contacting us and saying, Hello, like a normal person would before taking a cup of salt. No serious rip-offs of our material for vulgar commercial gain will be tolerated without major BF stomping action coming down on you, hu-man. Just as an added footnote (no pun intended): The film footage that Jim is talking about, to the best of my knowledge, was never part of the archives that Jim gave to me in 1974-5, when he departed the field. Nevertheless, I checked for him (and other researchers, e.g. Daniel Perez), many times, and never found anything resembling the missing footage. Jim also had an unfortunate robbery of all of his Bigfoot field research interview index cards and files, and I've often wondered if the film went out his station wagon window during that theft? Mr. Streufert, you are incorrect on your assumptions as to the correct location of the P&G Film site, Peter B. estimated that the actual site was approx 2 miles from the Bluff Creek bridge where he had walked in to the film site from. I my self have walked in from BCB more than once and with a GPS tracker which confirmed the 2 miles which by the way is where MK Davis's location is based on. I have been to the area many many times, have done hand written map segments, researched for many hours in particular looking over arial maps at the Humboldt Library and interviewed a number of witnesses including Al H.
Although your efforts have produced additional information that I appreciate, the fact is that the location that a number of people including Daniel P. think is the actual film site, is not the film site. Peter B. went there with Al H. and his son I believe the following year and had Al's son hold a large measuring pole which Peter B. took photos of to compare with the film frames of Patty from the P&G film (I'm sure you have seen them). While they were down at the site they paced it off at approx 75 yards wide and 100-120 yards long. This is the area down stream from the "bat boxes" near where Cliff B. says he thinks the site is but actually it's a bit further distance from there maybe a couple hundred yards more. The location up stream from the bat boxes is not wide enough and the hill sides leading to the stream are too steep. Look at the P&G film and it confirms this, the contours of the hill sides are much more gradual compared to the up stream location regardless of years of erosion. Daniel P. has even claimed that he has walked in from the BCB but if you knew him as well as others, regardless of his contributions in BF research, he cares only for himself and what he can derive from BF as a sellable comodity. On another note, I wanted to say that although I may not agree with information you focus on in some of your blog posts or some of your philosophies in general, I do appreciate your efforts and contributions within the field of BF research and find your writings to be scholastically a good read. Also, you seem to be an intelligent person so I'm sure that you realize that though you may think the people you have mentioned in your blog posts are upstanding people, good friends you have gotten to know over the last few years etc, be wary that these same people are not as they seem and over time you will come to know this when their true selves surface. It would be great to talk to you about what you know, and to know who you are. Perhaps contact me via the email link on this blog. Thanks for the compliments, too, however mixed. Anyway, I am open-minded, but I think all of the evidence is pointing away from the "MK" downstream site. In fact, Mr. Byrne has provided information to me just recently stating that it is NOT down there, but rather upstream right by the bat boxes. I will address all of the issues in your comment that I can in an upcoming blog entry. For now, check out my new one that contains the Byrne statements. One major thing: the "two mile" statement is only a rough *estimate* made by a guy walking without a GPS unit or pedometer. 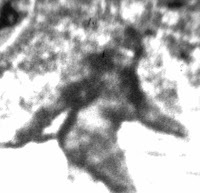 Gimlin has consistently said 2.5 miles, or variably between 2 and 3 miles. Two and a half miles is right at the upper area we are currently focusing on. I would have to take Dahinden's word over Byrne's in this case, as he was there the most, doing the most serious work, back in the day. It was Rene D. who marked the map with the site as it appears in Perez' booklet. Also, we have done laser measurements on both the upper sandbars, and YES, they ARE big enough for the dimensions you just mentioned. Here's the real problem: without citations and sharing of data, how can your statements above be made meaningful or verifiable? I have tried to get certain people to explain why they think that downstream area is the real site, and all I hear is stuff about how it "just feels right," or how the hills are not as steep. MK went there and found some metal logging cable wire, and claimed it was the rebar that Dahinden had put down at the site; however, rebar is NOT wire. It proves nothing. When I look at the PGF I see dark forest, with hills going up, back behind the creature--it IS steep hillside there. This is clear in the various well-known film site photos from the earlier days. We have found pretty perfect congruence in the site as we found it this year; whereas the "MK" site has trees WAY too far back, and no hill in the right position to account for the 1971 Dahinden "aerial" view photo. There is no "big bend" just below the MK site, either. In fact, there is almost nothing we could find that suggested this site as plausible based upon the known record and accounts. We ruled it out very quickly when we were there, though we probably walked around in it for an hour, just to be sure. Like I said---MORE LATER. I'd appreciate your comments, perhaps made to me privately, or else a presentation of your findings that could be publishable here as a rebuttal. We need to get all the information we can on this matter, or else it will never be resolved. Having everyone just saying "I know, you don't" won't get us anywhere. Though it's made clear in what I wrote, the introduction incorrectly states that I became interested in the BF phenomenon while attending Humboldt State. Instead, it was during my first year of attending American River College in Sacramento in 1963 that I found Ivan T. Sanderson's "Abominable Snowmen,: Legend Come to Life" in the college library. From the first few pages I was hooked on the subject and stayed hooked for the next nine years, only finally leaving the field because it had become a huge black hole, financially and socially, and I wanted to experience more of life, especially in the area of romance. (I have to say that romance was a pursuit tantamount to my Bigfoot pursuits in terms of fulfillment ;-) In short, I became passionately interested in the Bigfoot subject almost three years before arriving at Humboldt State in 1966. Thanks for that clarification, Jim! It's always great to hear from you and get your valuable perspective on this issue and its history. My neighbor, Jay Rowland, was just mentioning to me how you used to spend time at his house next door to mine up on the hill above Willow Creek. Very cool.